Renowned as a jewel of the American south-central region, Oklahoma is a wonderful destination for the mountain biking crowd, a state that features a variety of challenging and breathtaking trails just waiting to be ridden. The 20th-largest state in the Union by total area, Oklahoma is bordered to the south and near-west by Texas, to the far-west by New Mexico, to the northwest by Colorado, to the north by Kansas, and to the east by Arkansas and Missouri. This location, which features the desert landscapes of the American southwest, the mountains of the Northwest and the rolling plains of the Midwest region, makes the state one of the most terrain-varied and preferred locations for outdoor cycling enthusiasts. Oklahoma is home to a countless number of fun and challenging mountain bike trails—trails that cater to every level of rider, from the first-time novice to the competitive set looking to shave important seconds off their track times and perfect some much-needed skills. To illustrate this, in the following article we have profiled five of the state’s most popular courses and provided some pertinent information on each one of these tracks. The bluff trail at Turkey Mountain, located in the west of this popular park, includes several steep inclines and a spider web of interconnecting courses. To the north riders will find a more easily-navigable course—one without the elevation gain—but with an abundance of natural and manmade obstacles on this trail, they will still need to stay ever vigilant and remain alert. Located in the beautiful town of Lawton, Oklahoma, the 20-plus miles of trails at Lake Lawtonka represent an excellent destination for mountain biking enthusiasts. Here riders will find six distinct loops of single track that are as technical as they are fast, with all courses rated intermediate to advanced in terms of difficulty. Among other things, the trails include a number of short and steep climbs, spine-tingling descents, rock gardens, dry creek crossings, and rolling meadows that allow riders to reach top speeds. The loop trails at Lake Lawtonka are varied, with each offering a different type of ride. The Green and Red loops, for example, have the most flow, and although they are closed during hunting season—from October 1 through January 15—there is still plenty of time during the year to test out these tracks. The Blue Loop is generally considered the easiest of the six courses, but even it is rated as “intermediate” for its many technical sections. Finally, the Orange, Yellow and Black loops present the most difficulty (and fun), with terrain that is rocky, technical and challenging, with several grueling climbs amid many of the largest boulders on the course. The scenery at Lake Lawtonka is also worth the trip to this well-known mountain biking facility, with desert landscapes, trees, and natural flora serving as a backdrop to each and every trail. There is also a large wildlife sanctuary near the trails, so it is not uncommon to see wild bison and other animals grazing in the distance. Restrooms and other convenient facilities can be found at the Lake Lawtonka School House Slough, located at the eastern trailhead, in the middle of Medicine Park, and at the Lake Elmer Thomas boat ramp, where people enter the wildlife refuge on HY-49. The Trails at the St. Crispin’s Conference Center, situated in the town of Seminole, Oklahoma, feature over 8 miles of tough single track and a Jeep trail that includes elevation changes, several fast and flowing sections and some very difficult and challenging rock formations that force riders to use every bit of their technical skill. The Yellow Trail. The Yellow Trail spans 2.3 miles and includes features for the Beginner, Intermediate and Advanced-level rider. The Green Trail. This trail is 2.1 miles in length and is designed mostly for beginner and intermediate riders; with a brief advanced section of course that includes a tricky bypass. The Red Trail. The Red Trail is only 0.9 miles in length, but what it lacks in distance it more than makes up for in speed. As such, the trail is recommended for intermediate and advanced riders only. The Orange Trail. The easiest of the five loops, the Orange Trail is a wide meandering course that is perfect for beginner-level riders looking to master new skills. Blue Trail. Measuring an even one mile length, the Blue Trail, much like the Red Trail, is fast and technical, and is recommended mostly for advanced riders. All trails can be a bit gravely and loose in certain spots during the dryer, summer months, and because all trails are multi-use, riders are urged to stay alert for joggers and hikers. The St. Crispin’s Conference Center is a privately-owned facility that is operated by the Episcopal Diocese of Oklahoma. The center is open throughout the year and focuses its efforts on recreational programming for a variety of groups and organizations. Because of this, the mountain biking trails here are very rarely closed down so that a group may have exclusive use of the facility. Riders are reminded to call ahead before making their way to the facility. No fees are required to use the St. Crispin Trails, but donations for track maintenance are always appreciated. 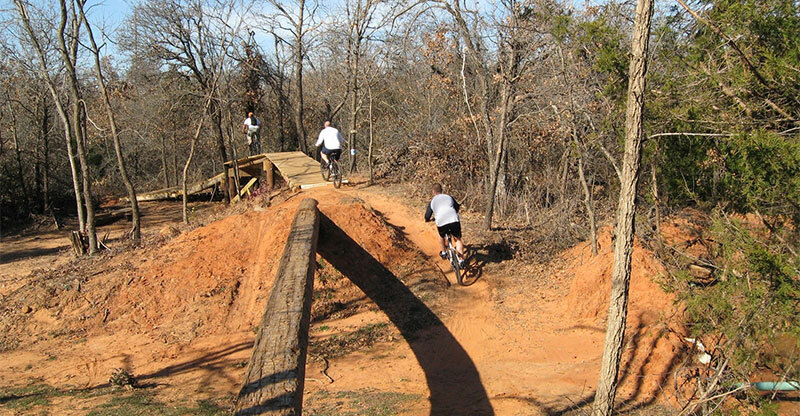 Located in the town of Claremore, Oklahoma, the Claremore Mountain Bike Trail and Nature Walk is a 4-mile, beginner-rated single track course that is nestled just east of Claremore Lake, a great place for biking, picnics and family get-togethers. Although the Claremore Mountain Bike Trail does not include any significant gains in elevation, it does include some rock gardens and a few other challenging obstacles to hold riders’ attention. The course is mostly wide and flowing, and the scenery here is definitely worth the trip. The park in which the trail is located has all of the usual amenities, including full restrooms, camping sites, bike wash stations, picnic areas, and playground equipment for the younger members in your group. The trail is a great destination for a family ride and for novices that may be new to the sport of mountain biking. The McMurtry Trails, which are nestled in a quiet corner of the state just outside of Stillwater, Oklahoma, boast a whopping 27 miles of cycling bliss, divided into four exciting loop trails that range from 6-7 miles each in overall terrain. Collectively, these entertaining courses offer hours upon hours of mountain biking fun and entertainment, and are designed with every level of rider in mind, from the first-time novice to the skilled cycling professional. The trails at McMurtry Park are accentuated by a collection of short, yet grueling climbs; tight, twisting switchbacks; and technical challenges ranging from rocks and large boulders to tricky jutting roots to a number of naturally-occurring hazards and manmade wooden impediments. Riders can traverse most of these trails at top speeds, but may be pleasantly slowed by the course’s rocky outcroppings, rooted climbs, the occasional washout and some fairly sandy corners that will force them to check their speed or run the risk of a potentially painful spill. The mountain biking trails are located at the Lake McMurtry Resource and Recreation Area—home to a serene, family-friendly lake that is surrounded by breathtaking natural scenery. The park offers both tent and RV camping, boating, fishing, swimming and even kayaking, as well as some of the region’s most beloved group facilities, highlighted by covered picnic areas, fire rings, outdoor grills and shower-equipped restrooms. After a day spent riding the beautiful and challenging McMurtry Lake Trails, cyclists can spend hours relaxing at one of the park’s many campsite areas, taking in all the natural flora and fauna this gem of a site has to offer.